Over in Bavaria, when Pep Guardiola recently started work at Bayern Munich he brought with him not one, not two, not three, but four members of his support staff from old club Barcelona - Manuel Estiarte, assistant coach Domenec Torrent, scout and video analyst Carles Planchart and fitness coach Lorenzo Buenaventura. Estiarte comes from a non-footballing background – a former water polo player he won Olympic gold at the Atlanta 1996 Games. “He has participated in many Olympic Games," said Guardiola. "I like to take his influences from other sports, he will help us." And of his support team, Guardiola added: "It's great that these people were willing to follow me. This is a challenge also for the families, I hope that we manage it well." Though one European agent recently told me that he would be watching Guardiola’s Bayern tenure closely given he no longer had Tito Vilanova - the current Barca coach –- working with him. Read into that what you will. In England, Manchester United manager David Moyes has brought with him scout Robbie Cooke, assistant Steve Round, goalkeeping coach Chris Woods and coach Jimmy Lumsden from former club Everton as they prepare to follow in Alex Ferguson’s not inconsiderable footsteps. Even "The Special One" Jose Mourinho can't do with a No. 2 - Rui Faria has been with him - at Porto, Inter Milan, Real and Chelsea - ever since he was coach of Portuguese club U.D. Leiria. 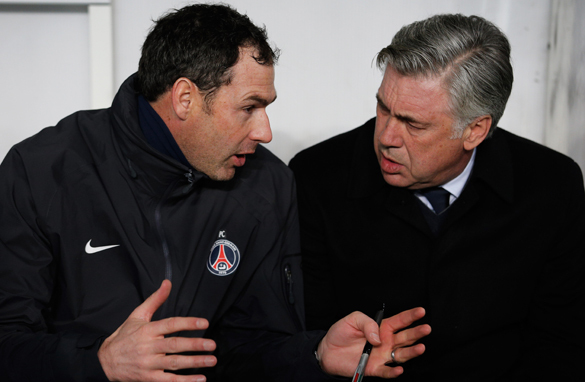 Clement’s close relationship with Ancelotti has ensured that the Englishman has worked with the Italian at Chelsea, PSG and now Madrid - an impressive trio of the clubs for the former physical education teacher, who has steadily worked his way up the football ladder. Assistants are the eyes and ears of the manager on the training pitch or in the dressing room, either playing the role of “good” or “bad” cop depending on the requirements of the team - and more importantly their boss. Many Liverpool fans argue that Rafael Benitez was never quite the same as Liverpool manager after he fell out with his right-hand man Pako Ayesteran. “It’s unbelievable but that’s the way it is,” Ayesteran told the Daily Mail in April of their fallout. Benitez and Ayesteran first met at Osasuna and then worked together at Extremadura, Tenerife and Valencia before they moved to Liverpool. But in August 2007 that relationship came to an acrimonious end. Was it coincedence that once Ayesteran had left Anfield, Benitez failed to win another trophy with Liverpool? “It wouldn’t be fair to just highlight his knowledge without how much he got from everybody who helped him and myself to be successful,” added Ayesteran, explaining the dynamics of their relationship. ‘There was Jose Ochotorena the goalkeeper coach and Paco Herrera who was coaching the second team and doing the scouting. We had the right synergy between us and once we left all those synergies disappeared,” insisted Ayestaran. Of course, Benitez might beg to differ, given the Spaniard, who is now Napoli coach, went on to win trophies with Inter Milan and Chelsea without Ayestaran. Arguably the most famous managerial partnership was Brian Clough and Peter Taylor, wonderfully realized in the film “The Damned United,” based on the novel by David Peace. It was a relationship that was frequently acrimonious and irreparably fractured in 1983. The rancor was such that Clough attacked Taylor in a newspaper article labeling him a "rattlesnake", "a snake-in-the-grass" adding, "We pass each other on the A52 going to work on most days of the week. But if his car broke down and I saw him thumbing a lift, I wouldn't pick him up, I'd run him over". Yes, a yes man who can make suggestions but will totally support the boss' decision when his own is not tben. Same with vice principals, vice presidents, deputy governors, housewife(? ).